The DAX index has posted considerable gains in the Thursday session. Currently, the index is at 12,116, up 0.70% on the day. 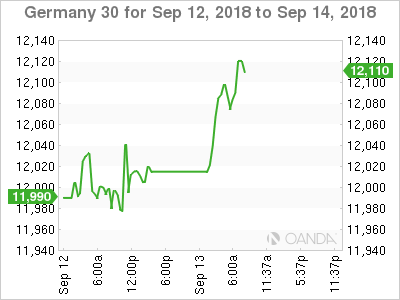 On the release front, German Final CPI dipped to 0.1%, matching the forecast. The ECB releases its main refinancing rate, which is expected to remain at 0.00%. On Friday, the eurozone releases trade balance. The ECB will set interest rates later on Thursday. With the Bank expected to maintain rates at 0.00%, investors will be focusing on the rate announcement and Mario Draghi’s press conference. The Bank is expected to lower its growth forecast due to weaker global growth and could spell out downside risks to growth. If the message is indeed on the dovish side, the euro could react with losses. Inflation in the eurozone is expected to remain steady at 1.8% in 2018 in 2019, which means that the ECB is on track to wind up its asset-purchase program in December. Any change in monetary policy will not occur before next year, and an interest rate hike is unlikely before the second half of 2019. The DAX has touched a 1-week high on Thursday, courtesy of automobile maker shares. BMW is up 2.37% on the day, Daimler has risen 1.71% and Volkswagen his climbed 2.17%. Investors gave a thumbs-up to reports that the U.S and China have renewed trade talks, which could spell relief for the auto sector, which has been hit by the recent tariff spat between the two economic giants. This week’s German data has looked soft, causing some concern about the health of the German economy. Earlier in the week, ZEW Economic Sentiment improved in September, but remains mired in negative territory. The indicator came in at -10.6, posting a decline for a sixth straight month. The survey press release noted that during the survey period, Turkey and Argentina saw their currencies plunge, and German industrial production was soft. On Thursday, German Final CPI dipped to 0.1%, down from 0.3% a month earlier.